Today we speak with Polish soprano Aleksandra Kurzak, who—along with Davinia Rodríguez—is performing her role debut as Lucia in Seattle Opera's Lucia di Lammermoor. Kurzak has received glowing reviews for her portrayal of a woman driven to madness, and we asked her what that experience has been like. This is your first time performing Lucia. What has been the biggest challenge in learning the role? What have you enjoyed the most? The biggest challenge has been all the memorizing, but I enjoyed the rehearsal time very much, and working with my great colleagues! People in our audiences and on our website have been comparing Callas and Sutherland and Sills, among other Lucias. Do you have strong feelings about any of those performances? Did any of them influence yours? I've heard all of them, but I don't like to compare myself with anybody. I always like to find my own character, and it was like that this time, as well. Lucia is a victim in the opera, but she does end up committing murder. Do you think she can be held responsible for her actions, or is it not her fault that she kills Arturo? She is out of her mind, and I think she doesn't really know what she is doing. You’ve done several comic operas in the past, and now you are performing a tragic role with one of opera’s most famous mad scenes. Do you have a preference? Would you rather do light, fun roles, or do you prefer more dramatic operas? I like interesting roles. I’ve sung Gilda and Violetta, as well, so I haven’t done only light stuff. 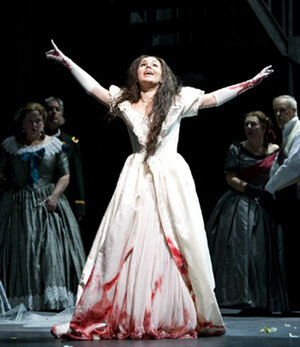 But Lucia is definitely a special one because of the mad scene, which I just love to play! How did you rehearse the mad scene? You move all over the stage, lie down, tear at your veil and clothes, wave a knife at people. How difficult is it to coordinate all those moves with your singing? How much is fixed, and what changes each night? This is not difficult at all for me, because it’s something that comes from inside me. Each time is a little bit different. I know the basic movements and when I have to be where, but director Tomer Zvulun gave me freedom to experiment. Because of that, I’ve heard from the people that the mad scene really keeps their attention, and never gets boring. You and Davinia Rodríguez are both performing Lucia for the first time. Did you know each other before coming to Seattle? Do you share notes and ideas during the rehearsal process, or do you work separately from each other? We knew each other, but we never worked with each other. I've sung with Davinia's husband, conductor Riccardo Frizza, a few times. Davinia and I have spent a lot of time together here in Seattle and have had fun and gone shopping, but we don’t talk about work.